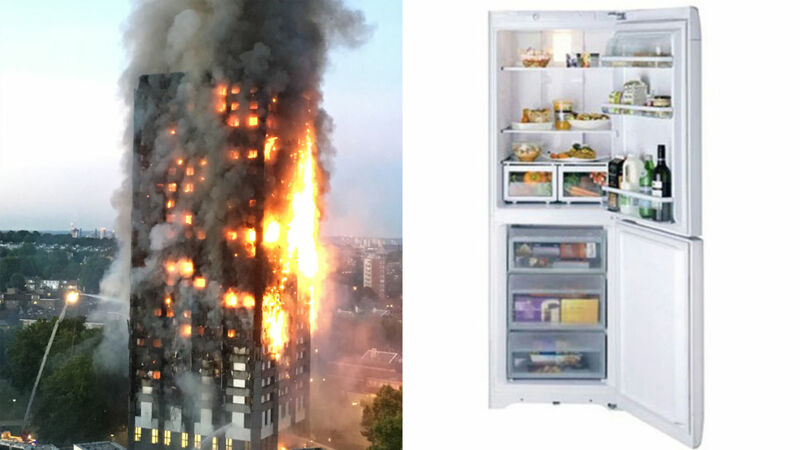 The Grenfell Tower blaze started in a Hotpoint fridge freezer and the building's insulation and cladding have failed safety tests, according to investigators. The insulation was also found to be more flammable than the cladding tiles, police revealed. They also said the Hotpoint FF175BP model had not been subject to any product recall and further tests were being carried out on the fridge. The Government has ordered an immediate examination by experts of the model involved and Hotpoint said it is working with the authorities in order to assist in the investigation. The inferno at the 24-storey building in Kensington left 79 dead or missing presumed dead. Nine victims had so far been formally identified. The update came as checks revealed at least 11 high-rise blocks across the country have combustible cladding similar to that Grenfell Tower. Metropolitan Police Detective Superintendent Fiona McCormack said the force will consider manslaughter charges as part of the investigation into the disaster. Documents and materials had been seized from a "number of organisations", she added. She said: "We are looking at every criminal offence from manslaughter onwards, we are looking at every health and safety and fire safety offence and we are reviewing every company at the moment involved in the building and refurbishment of Grenfell Tower."